The slogan of the SC State Fair implores you to “Find Your Happy.” For some people, that means riding the Fireball until they’re ready to puke an elephant ear. Others embark on a quest to try the most outlandish fair foods to debut each fall (like the Redneck Burger, a bacon cheeseburger, fried bologna, and baked beans abomination). I come back year after year for two things: dairy goats and cotton candy on a stick. Cotton candy, fairy floss, spun sugar—whatever the alliterative name, it’s a special treat with a modern history. Cotton candy was a product of the industrial age, and some of its charm still derives from the fact that you can’t make it without specialized equipment. At the turn of the twentieth century, a candy maker and dentist team designed a machine that combined heat and centrifugal force to fashion an impossibly gauzy candy. 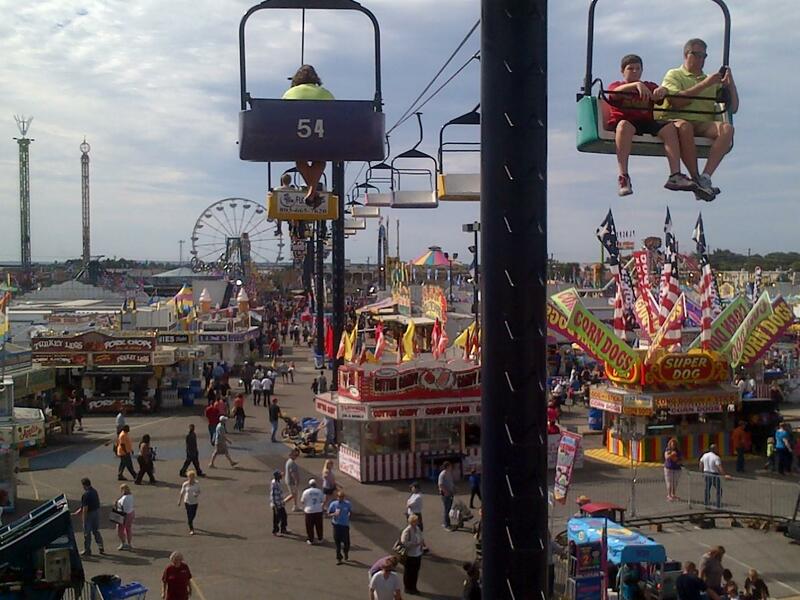 For over a century now, cotton candy’s been a hallmark of fairs, amusement parks, and festivals. 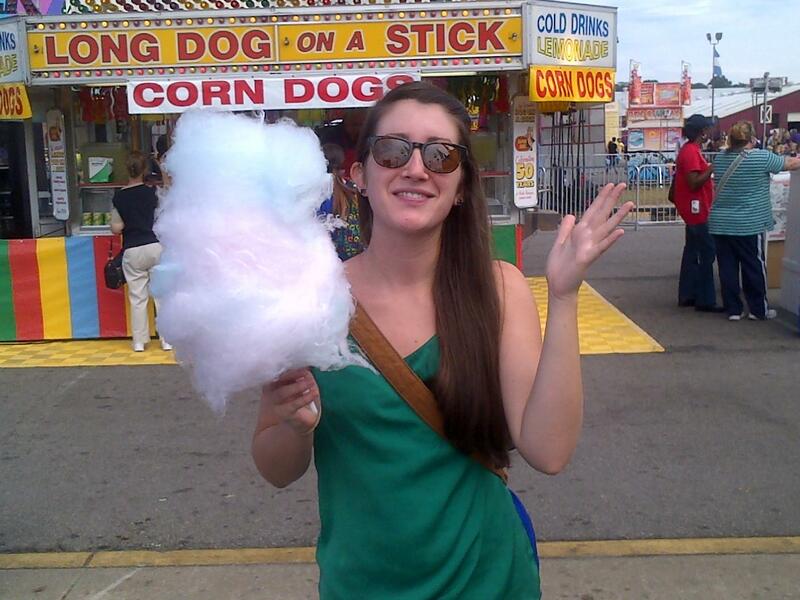 But in recent years I’ve noticed a decline in the number of state fair vendors selling cotton candy on a stick. Any–and most every–concession stand can sell the cold, condensed, bagged kind in bright blues and pinks, but that won’t cut it. I want the airy stuff that’s freshly spun, warm to the tongue, melting between my fingers, and draped over a paper cone that reminds me of being a kid. Cotton candy consists of nothing but sugar, or sucrose, with a little coloring and flavoring. 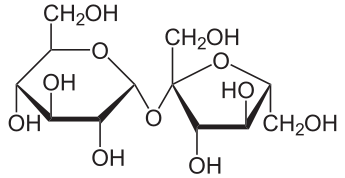 Sucrose, in turn, is comprised of a handful of carbon, oxygen, and hydrogen atoms (C12H22O11). When you pour sugar into the center of a cotton candy machine, the coils inside heat the sugar to its melting point and break the bonds of the constituent molecules. The hydrogen and oxygen atoms rearrange to form water molecules and promptly evaporate, leaving only carbon behind. The carbon burns, and the sugar begins to caramelize. All of that is basic chemistry–the ingenious part is in what happens next. As the sugar caramelizes, its container spins at a speed of nearly sixty revolutions per second. Tiny holes perforate the sides of the container, through which the sheer force flings strands of the hot, liquid sugar. The filaments are just 50 microns in diameter, and they turn solid as soon as the meet the cool air outside the container. Multiply those filaments by the thousand, and you get the delicate mass of cotton candy. After over an hour (and a pitstop to see the dairy goats), we were nearing the end of our journey. That’s when I spotted a stall where a woman stood hunched over an operating cotton candy machine. I asked if they could make it for me on a stick. “Well, of course,” she said. I told her that her stall was, in fact, the only one in the whole fair that had obliged. “We aim to please, honey,” she said. ERIN WEEKS is a science writer from Charleston, South Carolina. She just moved to Durham, North Carolina to write for Duke University. Awesome post; it was a great read and helped with my chemistry quiz.